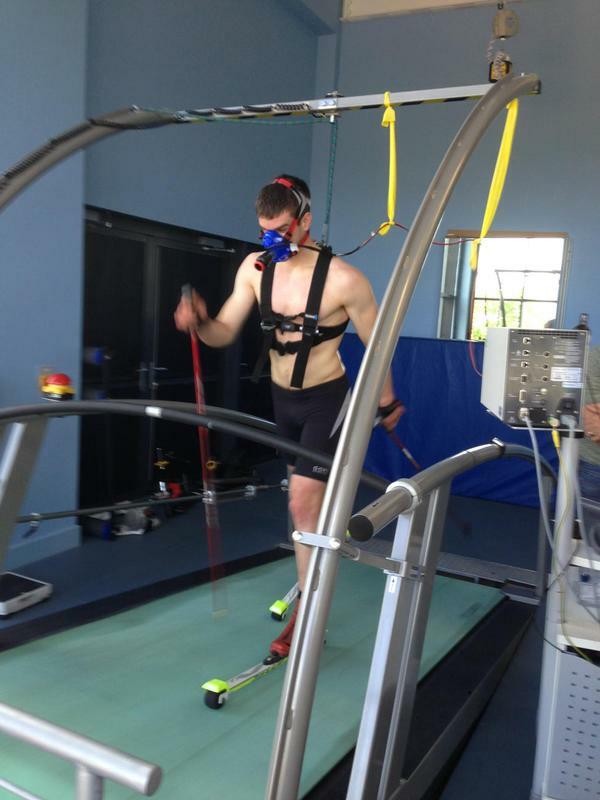 On Tuesday I was over in Stirling for some physiological testing at the Scottish Institute of Sport. We usually do this twice a year, firstly at the start of the training season (now ish) then again in October before we start racing. This is primarily to check how I’ve responded to a summer of training as well as to monitor improvement between years. After a year out of racing and a much reduced training year I was pretty apprehensive about how my numbers were going to look. The first test we do is a threshold then maximal test on rollerskis, for consistency this is done on a (very large) treadmill at 12% gradient. The speed is gradually increased at set intervals whilst my heart rate, respiration and blood lactate levels are being constantly monitored. This continues up to the point at which lactate starts to accumulate exponentially. This gives us useful data about my anaerobic threshold, both the heartrate zone at which this occurs, as well as the speed, which can be compared with subsequent and previous tests. The profile produced by comparing blood lactate levels and heartrate gives a fairly reliable estimate of the heartrates I should be aiming to stick to during my summer training. Hopefully meaning I’ll be training the energy systems I intend to for specific sessions. Avoiding training too hard in long sessions or too easy in intervals etc etc. Following a short break I’m back on the treadmill and now pushing to maximum, the speed is increased for every minute until I can literally go no further, this is fairly unpleasant. The idea behind going through such misery is to find VO2 max, the maximal volume of oxygen my body can process. Unsurprisingly after a year out of top intensity interval training my VO2 max was slightly down on previous tests! Our final test outside of the weights room is very simple. Go as far as you can in 15 minutes on the Concept 2 Skierg (like an upright rowing machine). This is a sweaty experience. Overall my numbers were only a little down on my previous testing data from October 2013 (some things had actually improved!). Given that this was easily the best shape I have ever been in, I think I’m starting this summer from quite a reasonable baseline. However I’m hoping things will rapidly improve, as I can now build up both volume and intensity without studying getting in the way! Previous Post May 1st, a fresh start. Next Post Skiing in June!